Posted 9/12/2016 8:01am by Jennifer. 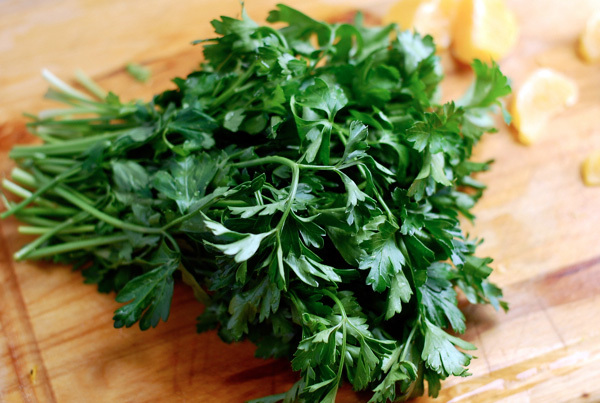 Parsley can add a fresh taste to any dish. Here are two dishes featuring parsley, a classic parsley potatoes recipe, and a twist on well-known basil pesto. Posted 9/6/2016 3:44pm by Jennifer. There are only a couple weeks left in the sweet corn season. As we pick through our later fields, the chances of corn tip worm and corn borer worm increase. We try our very best as we are hand-picking to throw out any ears that have extreme damage, especially in the middle of the ear. However, if there is a corn tip worm at the end of the ear, we still pick it and include it in the vegetable shares. One of the reasons we choose to grow our current variety of corn (which is also our favorite tasting) is because it produces a nice long ear. So, even if you have to cut the end off due to a worm at the tip, you are still left with a beautiful ear of corn to enjoy. Some may think that our corn has a lot of worms, and that may be true. Even though our corn is not certified organic, we still like to raise it as organically as possible. This means that we only use non-GMO corn, not "Round-up Ready" corn. We also use organically approved pesticides, and we only use them when absolutely necessary. We know that most of our customers prefer a worm at the tip of the corn ear over the use of synthetic pesticides and herbicides. There's a reason why it is very difficult to find certified-organic sweet corn, because it's very difficult to grow organically. So, we will continue to try our best at growing it as organically as we can. Thank you for your understanding and continued support, and hope you enjoy your sweet corn! Posted 8/30/2016 6:11am by Jennifer. Posted 8/22/2016 11:08am by Jennifer. We are at the height of the tomato season, so enjoy it while you can! My Mom used to love tomato season. If you wanted to put a smile on her face during the summer months, you simply had to hand her a freshly picked tomato. It didn't matter if it was big or small, yellow or red, bruised or cracked. She'd take it gently from your hand and caress it in hers with a huge smile on her face - as if you had just handed her a precious jewel. She'd eat them everyday in all sorts of forms, but she enjoyed them most straight out of hand with just a touch of salt. Two of my favorite ways to enjoy tomatoes are bruschetta and fresh salsa. It's ideal to make both these recipes with a paste or plum tomato, but if I don't have those on hand, I simply use regular slicing tomatoes and strain some of the extra liquid out. Posted 8/15/2016 7:05am by Jennifer. If sweet corn is not on your menu for this week, please be sure to take advantage of sweet corn season by freezing it for later use. Believe it or not, we don't eat a lot of corn in our house besides in the summer, but I'm always sure to freeze a little for special occasions - like Thanksgiving & Christmas dinner. I also sometimes put some corn in a batch of fresh salsa, which you could make with the tomatoes, onions, garlic, and peppers that you receive this week. Or I have found that my kids LOVE succotash made with lima beans and corn (I've included a succotash recipe below that is very similar to what I make). For any of these uses, simply husk and boil the corn for 3 minutes just like you normally would. Then place them in cold water to stop the cooking process. Once they're cooled stand the ear on end on a cutting board and slice the corn off from top to bottom, rotating the ear to get all the kernels. The trick is to cut deep enough to get all the kernels, but not so deep that you get the cob. If you want to then freeze the corn, place it in a freezer bag (I find that a quart freezer bag is the right portion for my family), expel any extra air, and flatten the bag, so it will neatly stack in your freezer. 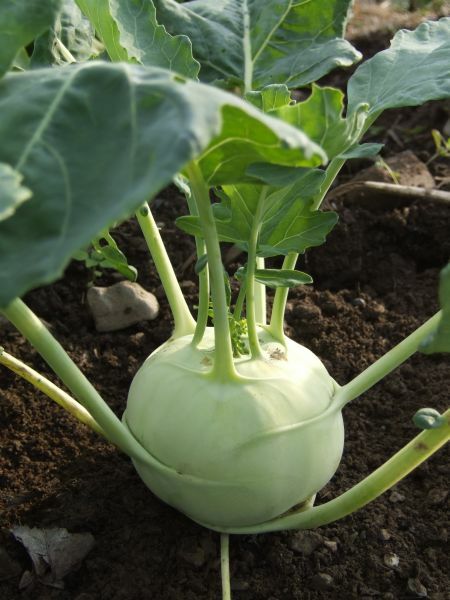 You'll also be getting kohlrabi this week. People who are new to kohlrabi always ask, "What does it taste like? ", and Chris would always describe it as a cabbage flavored turnip. Come to find out "Kohlrabi" is a German word in which "kohl" means cabbage, and "rabe" means turnip. This is just another instance for him to tell me how smart he is. So what do you do with it? Lots of people love to eat it like an apple. Simply peel off the tough outer skin, sprinkle it with salt (optional), and enjoy. We actually have a customer who plants tons of these in his garden, because he takes a kohlrabi in his lunch everyday instead of an apple. My favorite ways to eat it are either in a slaw or in fritters. The slaw is prepared with kohlrabi and apples cut into matchstick pieces with toasted walnuts and a vinaigrette. The fritters are a mix of shredded potatoes and kohlrabi. Of course the kids like the fritters best! I can't believe that summer is winding down already. Hope you are enjoying this summer bounty while it's here. Before you know it we'll be eating summer squash and wearing sweaters! Posted 8/2/2016 8:25am by Jennifer. I think you'll really enjoy the watermelon. It's especially juicy this season, because we've been able to keep a steady supply of water on it through the use of drip irrigation. To quote my son, Charles (who is the official watermelon taste tester), when he was surprised with the first watermelon of the season, "YEEEESSSS! I've been waiting for you all year!" We cut it in half, and he eats straight out of the rind like it's a bowl. "Ah, I'm in heaven!" We hope you like them as much as Charlie does! You probably already have your favorite ways to make all of these items, so I'm just going to include a few suggestions on how to prepare patty pan squash, in case you are a low sugar/starch member. Patty Pan squash is similar to other summer squashes in that it has a very mild flavor and can be prepared in a variety of ways. Of course you can make it similar to zucchini - fried, grilled, baked, etc. 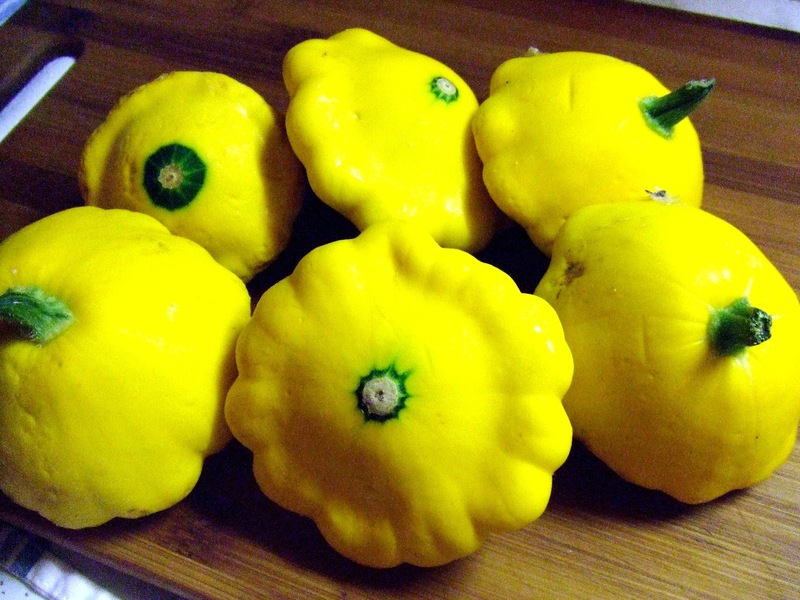 If you pick up your CSA share at the farm and would like to try some patty pan squash, we'll have some for sale of Wednesday. Posted 7/26/2016 7:35am by Jennifer. I'm so excited to share bok choy with you this week! Bok Choy is an Asian Green similar to cabbage. Of course it's good in stir-fry, but I think this week I will try roasting it quickly in the oven. Or, my family loves homemade egg rolls, but I think a spring roll would be better suited to this hot summer weather. Here are a couple recipes to give you some ideas on how to prepare bok choy. Do you feel like you're drowning in zucchini? That's not a bad thing...it's a blessing. Hopefully, this link will give you some news ways to use zucchini. Hope you're having a fantastic summer. Stay Cool! Posted 7/19/2016 6:39am by Jennifer. Fennel might be new to you, but I think once you try it, you'll really start to look forward to it as a treat when you receive it in your produce share! It has a fantastic crunch and a mild anise flavor. My favorite way to enjoy fennel is in a fennel and orange salad. Here's a salad recipe similar to what I make. In addition to the other ingredients used in the recipe, I also like to add a little red onion. Fennel is traditionally used in Mediterranean cooking, so it fits perfectly with some of your favorite Italian dishes. If you're an olive lover (like my Josie) then you'll really like this recipe for Marinated Olives with Fennel. Or it can be prepared with chicken in a slow cooker for a convenient meal. Posted 7/12/2016 2:22pm by Jennifer. 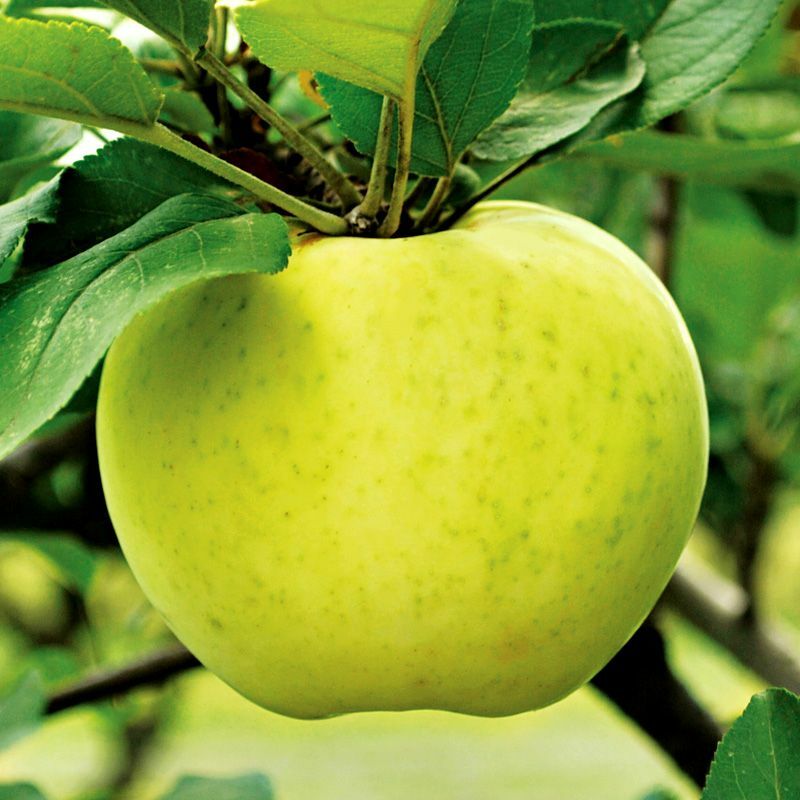 This week you will receive Lodi apples from McConnell's Farm in Independence Twp. These are not organic. Lodi apples are an early season apple, ripening in mid-summer. They are a tart apple, so they're good for pies or sauce. They are not a storing apple, so they should be kept in the fridge and used within a week or so. I don't have a lot of time to process jars of pickles in a water bath, and refrigerator pickles require no processing. You can usually make smaller batches of refrigerator pickles, which equals less time and fewer required ingredients. I like the crunchiness of a refrigerator pickle. Here are two recipes for some easy refrigerator pickles - one spicy, and one not. Posted 7/5/2016 8:34pm by Jennifer. "We LOVE our delicious potatoes - especially heart-shaped ones!" You will receive New Potatoes. These are potatoes which have not been cured in the ground yet. Their skins are extremely tender, so we will not wash them. It will be best for you to wash them right before use, and there's no need for peeling, because their skins are extremely tender. My family really likes when I make these on the grill (or oven using the same following method). I thinly slice the washed potatoes and place them in a foil pack with sliced onions. I toss them with olive oil, salt & pepper, and seal the packet up tightly. I place it on a grill that was heated on high and then reduced to low (or oven preheated to 400F). I cook them until the potatoes are fork tender - about 10-15 minutes. We also grilled some zucchini this past weekend. I slice the zucchini lengthwise. I make sure the slices are relatively thick, so they will hold up to the grilling process without falling apart. I toss the sliced zucchini with salt, pepper, and olive oil. I place the slices on a low-medium heat grill. After a few minutes I check for some nice grill marks and flip them. Cook for another couple minutes. Chris ate his grilled zucchini plain. I put a little leftover pesto on mine....mmmm. I had some beet roots accumulating in my fridge (Note - if you cut the tops off the roots, the roots will store in your fridge in a plastic bag for months. As long as the roots are firm, they are good to eat). I made a couple quick jars of pickled beets, similar to the recipe below, except I put sliced onions in the jars also. I also put chopped garlic scapes in the jars, and omitted the chopped garlic cloves in the brine. I think next time I have beets to use up, I'm going to try this Refrigerator Beet Salad recipe that I found on the Food in Jars website, which is a great resource for small scale canning recipes. And if you still have basil left from last week, you can still make pesto out of it. If you don't use all the pesto at once, leftovers can be frozen in ice cube trays. When the cubes are completely frozen place them in a freezer bag for storage. Put a cube or two in the pasta sauces that you make throughout the winter to add a little summer freshness. Typically pesto sauce is made using pine nuts, but if you are allergic to them, substitute another nut. I use almonds or walnuts. Here's a basic pesto sauce recipe to get you started. 1. In a food processor, blend together basil leaves, nuts, garlic, and cheese. 2. Pour in oil slowly while still mixing. 3. Stir in salt and pepper. Return the drained pasta to the hot pan, add a tablespoonful or so of pesto, and add the water a little bit at a time until the sauce reaches the desired consistency. The starch in the water will help to thicken the sauce and allow it to coat the penne or linguine (or whatever shape you choose).